A rematch between the Steel Legion and Vior'la Tau. I used the same list of Super Heavy Tanks, Artillery and Infantry, while Andrew changed his very slightly, dropping a Manta for Spacecraft and Tiger Shark Aircraft. My Guard list was same as last game, where I suffered a crushing loss! Andrew's Tau list used a Spaceship and orbital Manta drop, plus Tiger Sharks. 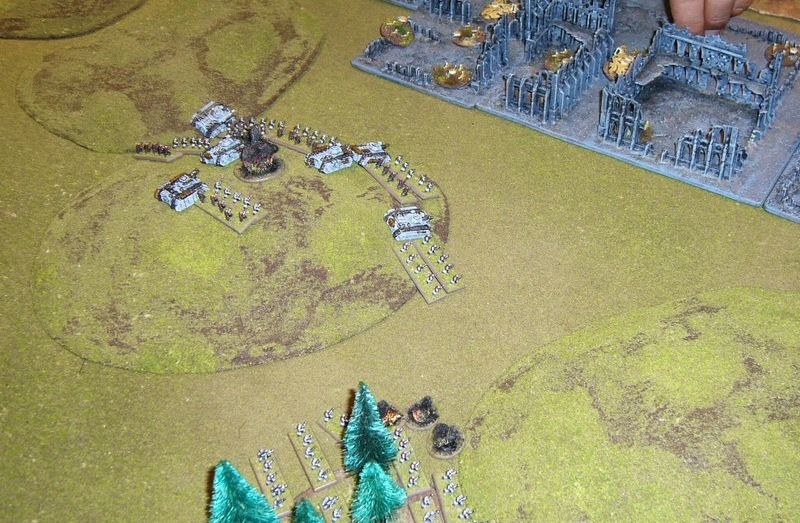 Here's the setup, courtesy of my partner who kindly setup the terrain for us for this game! A central ridge of hills and area of ruins, with forests around the outside. Andrew chose corner deployment. I'm in the lower left. Tau Stealth Suits teleport in, but I win the Strategy Roll and my Mechanised Infantry Company here sustain fires and blows the hell out of them in a very satisfying manner. The three surviving suit units head for the hills (literally). 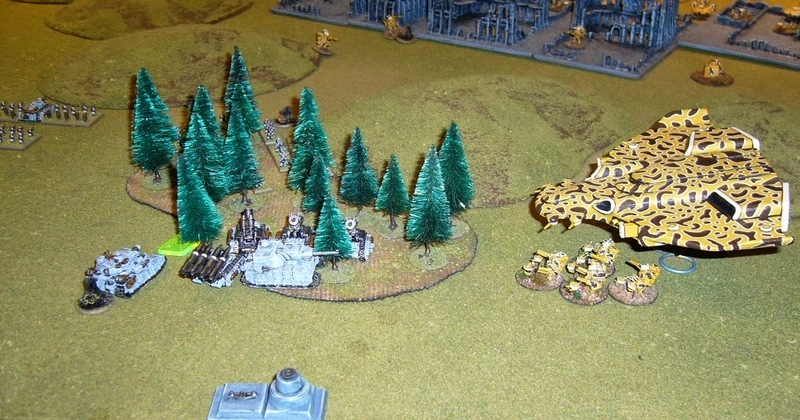 I retain initiative, and my Shadowsword moves to the woods to gain cover, and kills a Devil Fish transport from the Tau formation in the distance. 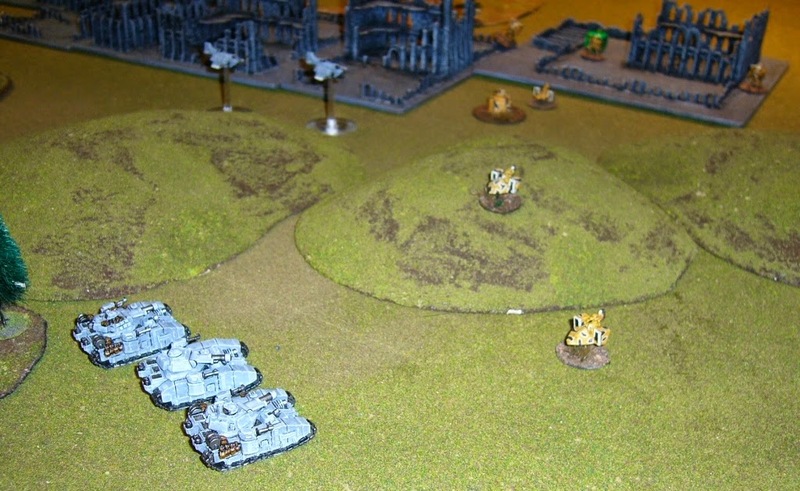 Tau recon units then swoop forward, targeting my Manticore Artillery. 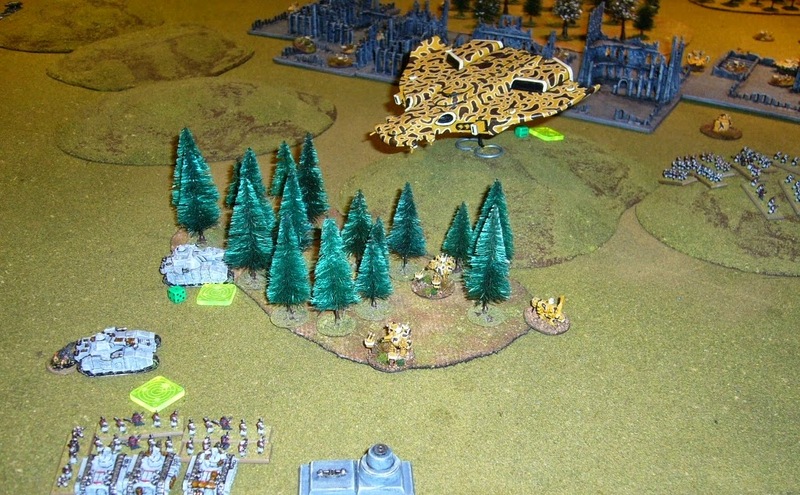 The first Recon formation kills a Manticore, and the remaining two Manticores break. 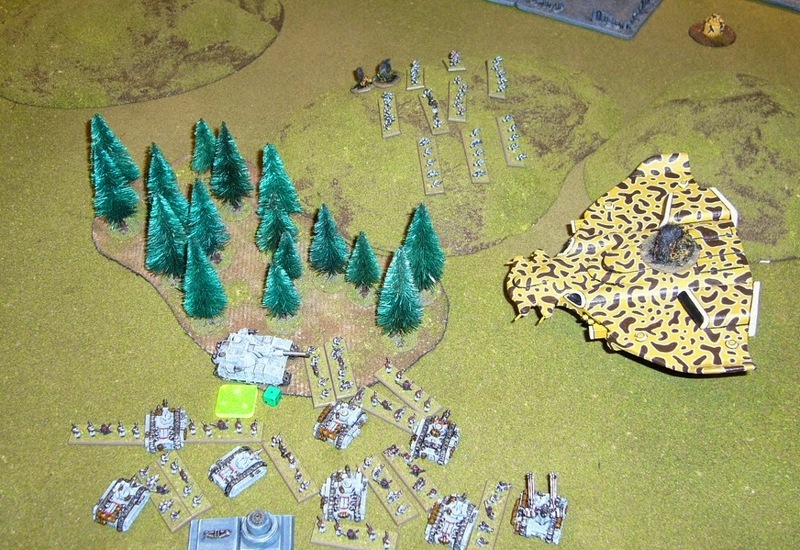 Another Tau Recon formation retains initiative and kills another Manticore. 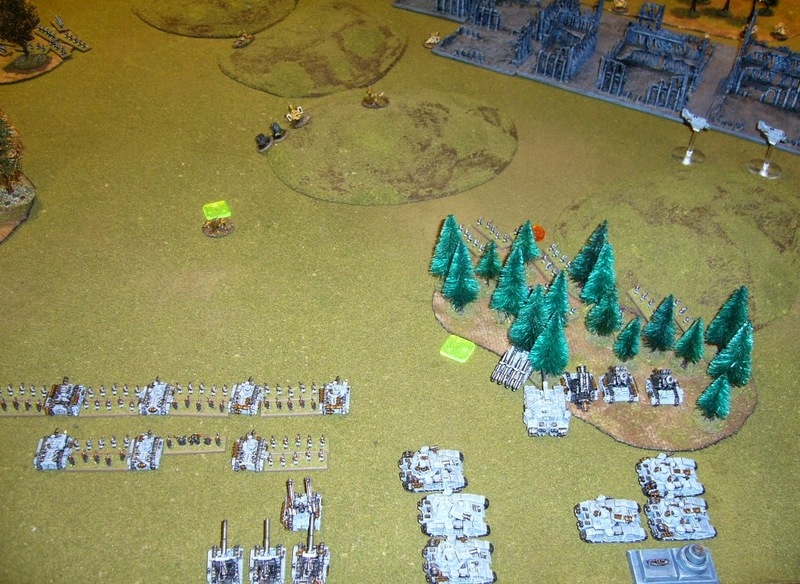 I double forward with the rearmost Baneblades and break the Tau Recon formation, but another comes forward. I finish off one of the Recon formations with Thunderbolts. 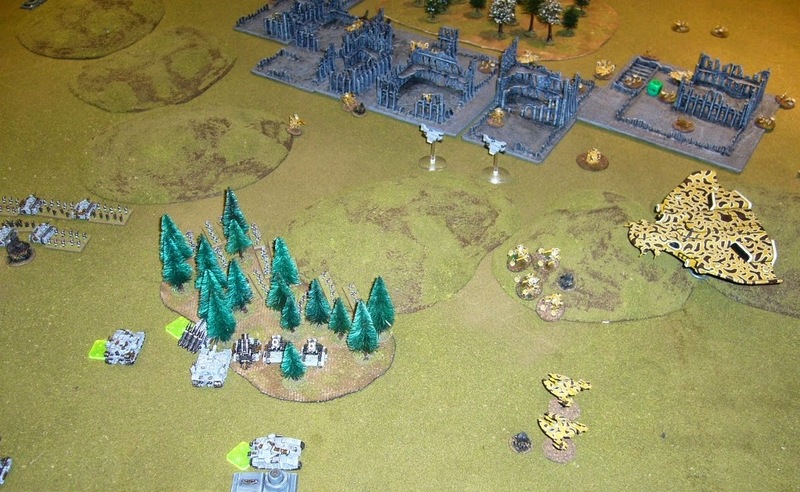 Another Shadowsword doubles forward and wipes out the remaining Stealth Suits. Tau Recon units try and markerlight my units and do coordinated fire missions, but ineffectually. I double my other Baneblades forward and wipe out another Tau Recon formation while moving towards the Take and Hold Objectives here. All is going well, but then the Tau Spacecraft does its orbital drop and the Manta arrives, and also the AX-10's all targeting my Baneblades. Disaster! A series of critical hits in addition to shooting from the Broadsides and Spacecraft and I end up losing four of the Baneblades! My two remaining broken Baneblades fall back. End of Turn 1, which started out promisingly, until the loss of the Baneblades. Tau have lost 3 Recon Formations and a Stealth Suit Formation. My Baneblades are down to a single tank each, one of which rallies. 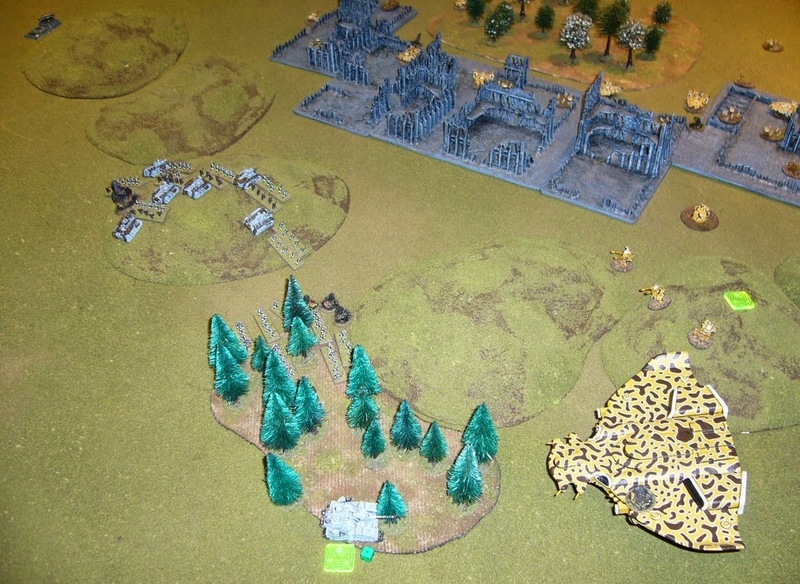 My lone Manticore fails to rally. 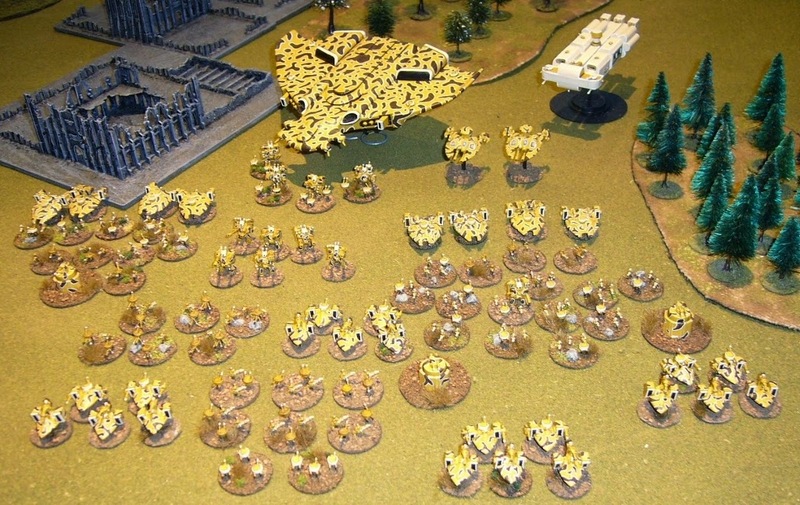 Tau win the Strategy Roll. The Manta does an engage action together with Crisis Suits, against my intermingled Bombards, Shadowsword, Baneblade and the broken Manticore! 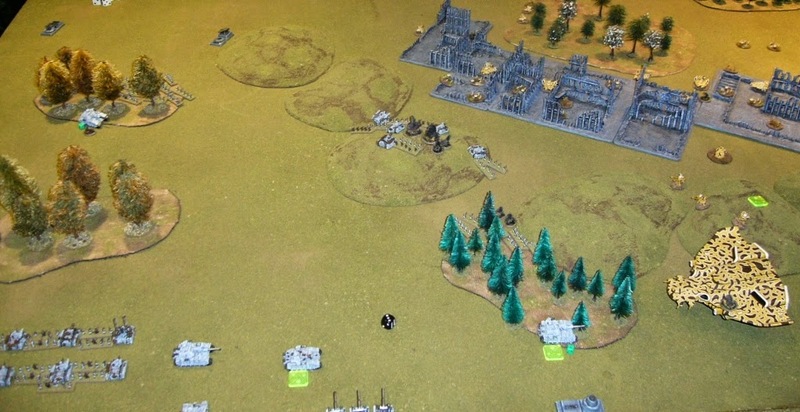 I lose all the artillery and the Shadowsword and Baneblade retreat broken. 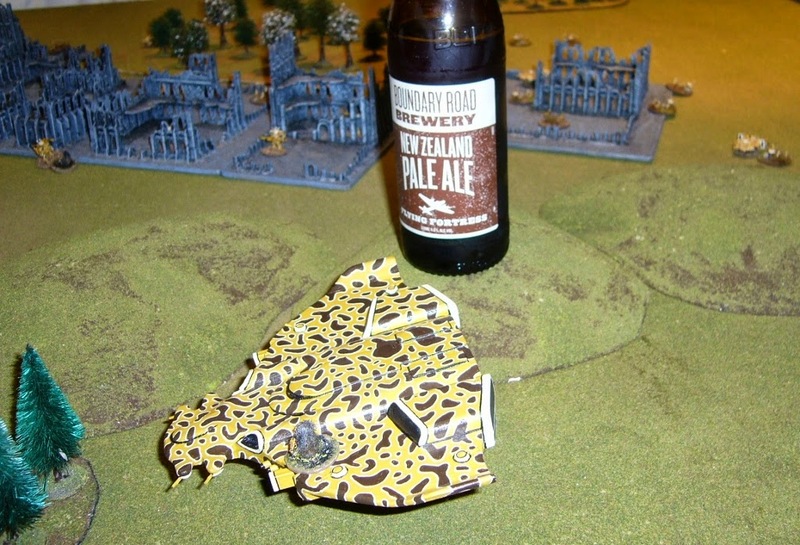 Tau beer choice seems appropriate for the Manta, as shots bounce off its hide. My Supreme Commanders formation engages the Broadsides, breaking the formation and killing half of them. 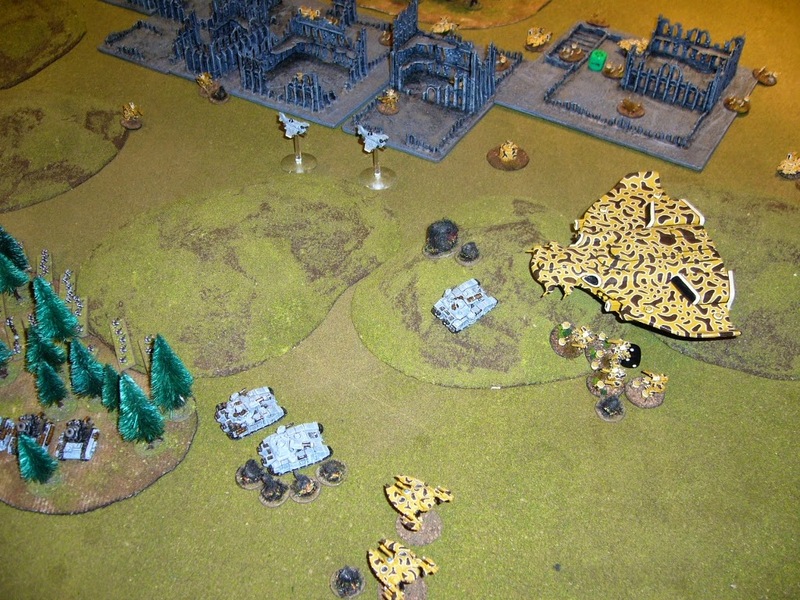 Tau concentrate fire upon my Supreme Commanders Formation, killing some infantry and Chimera transports. More fire upon the Supreme Commanders Formation! They break and fall back to a woods. ...so that the next infantry company gets a crossfire on the Manta. The Manta takes more suppression and some damage but does not break. 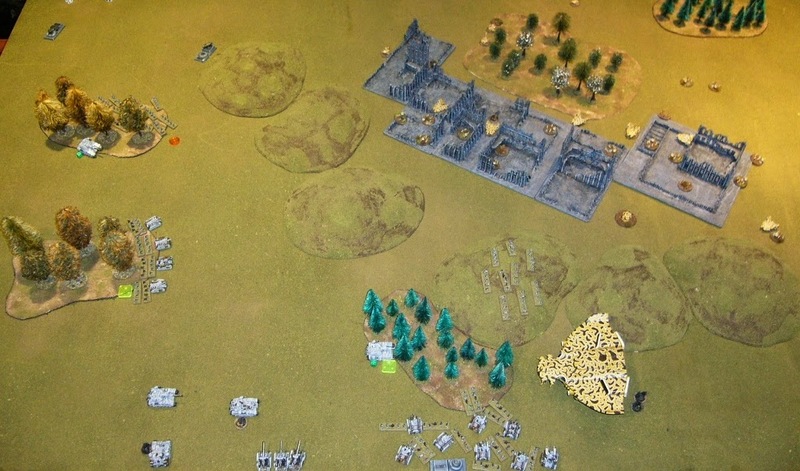 End of Turn 2. My Supreme Commanders formation is still broken, and my formations are starting to look thin on the ground. 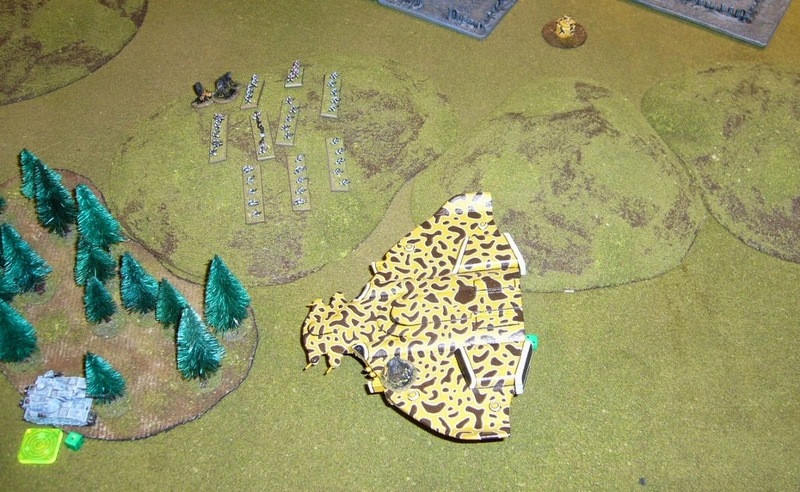 The Manta then retains and blasts the Mechanised Infantry Company, inflicting many casualties almost breaking it. Shadowswords line up the Manta and break but cannot kill it. Not the best target given the game objectives but it is the only thing they can reach. 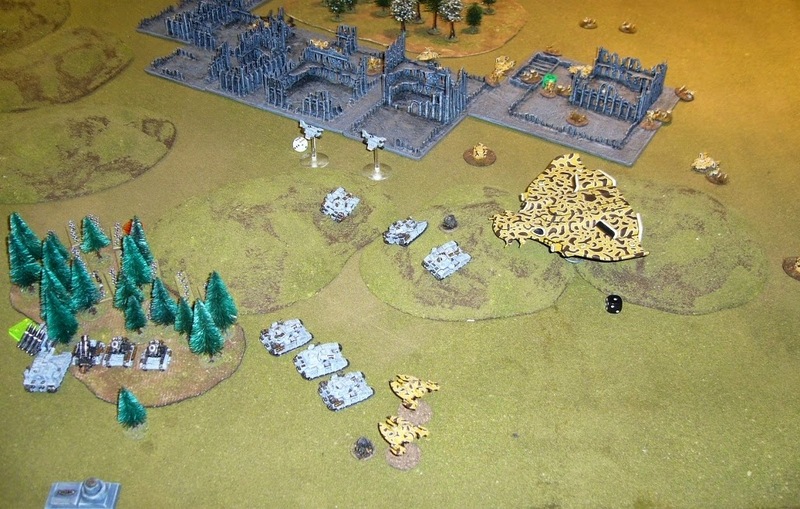 Tau Crisis Suits move to capture my Blitz objective, breaking my Mechanised Infantry Company. 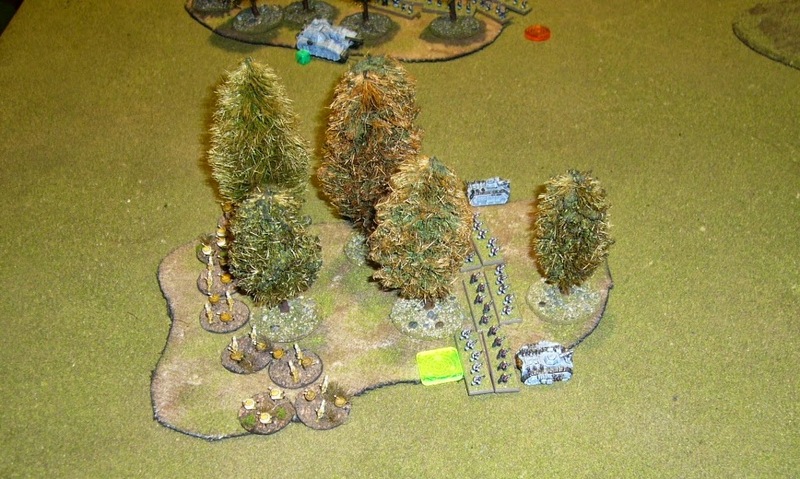 A lone Blaneblade drives forward guns blazing and drives them off though, and they are eliminated through a crossfire. 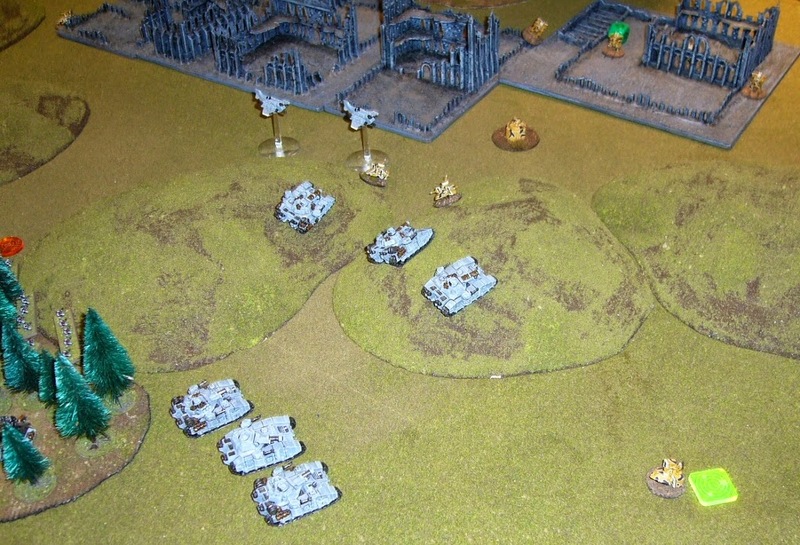 My other infantry company on the far left flank engages and breaks the Tau Stealth Suits and claims my objectives here. Too late though, Tau have another activation remaining and have already won 2-1 with "Break Their Spirit" and "Defend the Flag" victory conditions, to my "Defend the Flag" victory condition. 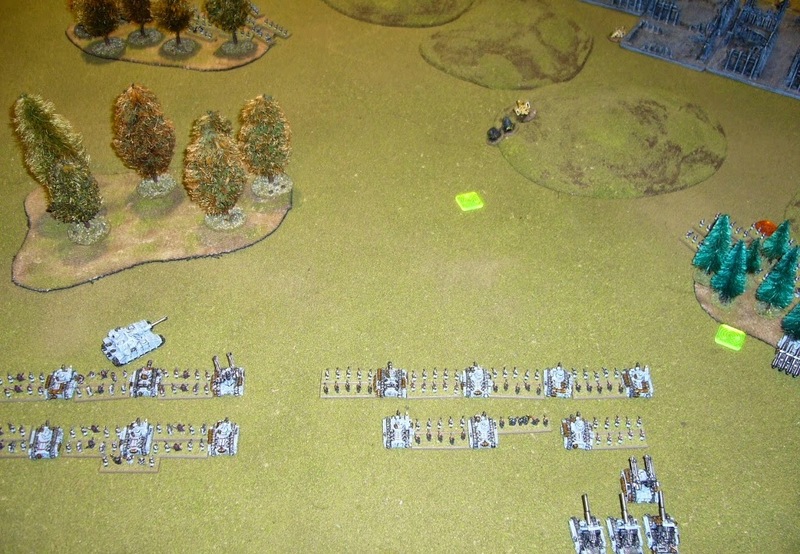 The Imperial Guard forces appear to be in full retreat following our initial encounter with them. We will continue to advance with screening elements and to seek and engage the invaders. 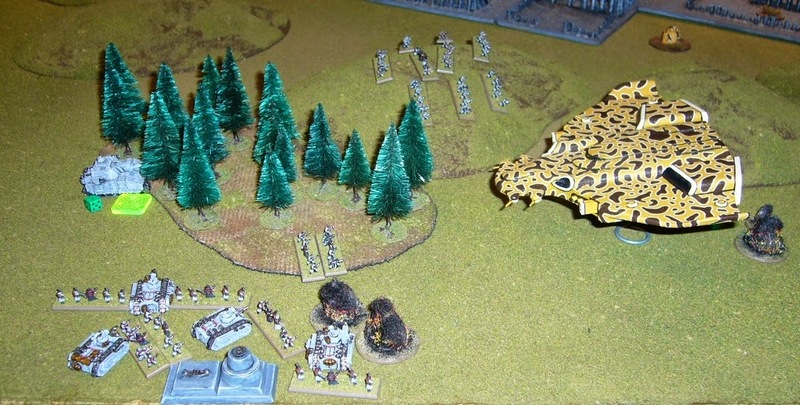 The total loss of one and significant damage to the other of our Manta support craft meant the human forces were able to retreat with most of their heavy tanks and artillery. Orbital intercepts of Imperial communications suggest that they have managed to funnel significant reinforcements of man-power onto their planet-head. The Shas’el Kavaal [lit. 2nd Commander Strike Group] is currently in space with the Manta repairs nearing completion. Their Pathfinder Groups have been temporarily transferred to Her’ex Shas’vre [lit. Cloak Commander] control while we attempt to locate the enemy. The Manta and Shas’el Crisis Cadre will deploy by planetfall within one Dec [lit. unit of time approx. 1.5 hours, here late Turn 1] of contact being made. 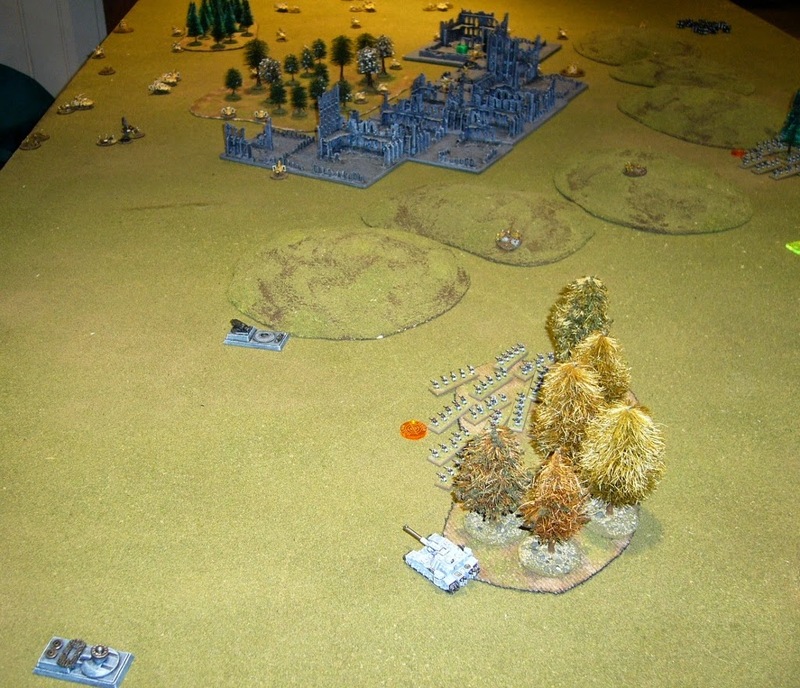 They will target the main enemy armoured concentrations. A squadron of AX-1-0s will be attached to support this mission. The Her’ex Kavaal will advance over a wide front to locate the enemy. 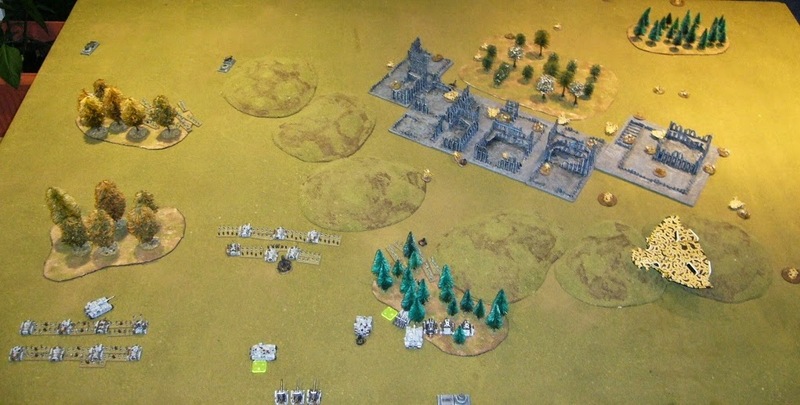 Once contact is made priority will be given to: (1) suppressing enemy AA assets, (2) suppressing enemy artillery, (3) locating, marking and engaging, when possible, the enemy regimental HQ, (4) locating and markering enemy Shadowswords. With so many Broadside suits still awaiting repair one XV88 group will be forward deployed by Orca, prior to contact, to garrison the ruined city on our line of advance. The Shas’o will advance with the main body of Fire Warriors. The limited Devilfish transport assets will be shared between the two FW Cadres available. This Kavaal will secure the objectives on our current line of advance and provide fire support for advanced elements. Additional Skyray cover will be deployed with the FW Cadres to help protect operations by the AX-1-0 Squadron. Tau’va [lit. For the Greater Good]. 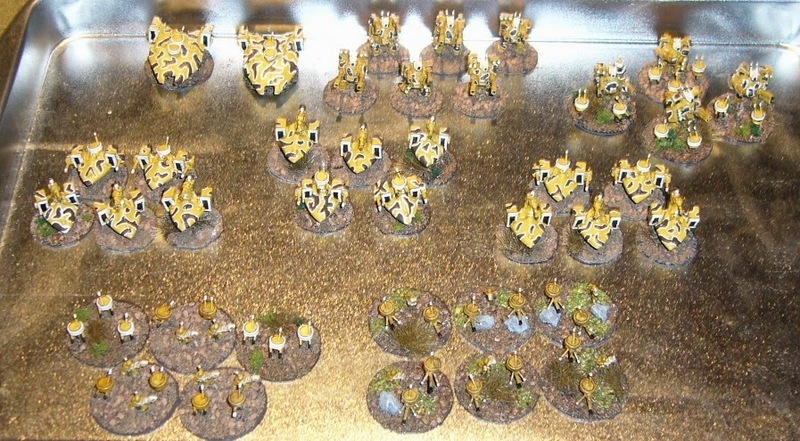 Nice report...love the Tau army...have you used any of the Onslaught mini's Okami Technocracy Combine? The manta looks super sweet. Cheers Rory, yeah Onslaught Okami are the way to go for Tau these days, and Andrew said he would have used them if they were available when he was converting these a couple of years ago. New Skinnerz (Orks) from Troublemaker!